Natio Daily Protection Moisturiser (£13.60) – Keeping your skin moisturised really is key. If you’re like me and you’re a bit lax with your skincare regime (sorry), make sure you at least use a daily moisturiser. I’m loving this Natio Daily Moisturiser at the moment, it’s lightweight so it’s perect for every day wear, it has a non-greasy formula that helps protect skin from harmful UVA and UVB rays, and it’s enriched with organic rosehip oil, lavender and lemon to leave skin hydrated, soft and smooth. Mary Elizabeth Juniper & Jojoba Hand Cream (£9.50) – And while your at it, don’t forget your hands! We use our hands all the time, they are one of the most active parts of the body, but do we look after them? Well I don’t. I’m a handcare novice. It’s never really been something I thought about until now. I’ve recently started using this Mary Elizabeth hand cream and it really is working wonders for my tired old hands. Nurturing Juniper Oil soothes skin, whilst Jojoba Oil has antiseptic properties and helps to retain moisture. Other active ingredients include Calendula Oil which calms and promotes suppleness for youthful looking hands. Carmex Lip Balm (£2.69) – My lips are literally a sore point for me most of the year round, so come winter I like to up my lip care game. This Carmex Lip Balm lives in my makeup bag for relieving dry lips on the go, and it really does work wonders. The only thing I don’t like about it is that the product comes in a pot, so you have to stick your finger in to apply. I can live with it though! Anatomicals High Noon for the Prune (£4.00) – If you’re susceptible to dry patches on your skin that require a little extra TLC than what your regular moisturiser can offer, get some of this Anatomicals Dry Relief Balm on and let it work it’s magic. High Noon For The Prune is a natural remedy for eczema and extremely dry skin. The formula includes all-natural ingredients and features the amazing healing power of the Cocus Nucifera Extract and Gardenia Tahitensis. This stuff will really soothe the driest skin, and it can also be used on sunburn, rashes, and minor scrapes and burns. It’s suitable for children too which is super handy, so this is definitely a handbag essential for me. 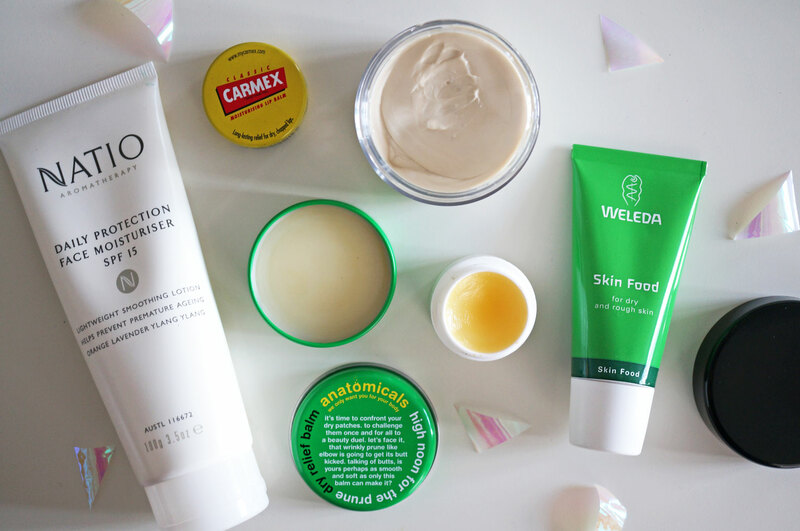 Weleda Skin Food (£9.95) – This is one of Weleda’s oldest products, originating from 1926. A product that stands the test of time like that really says something to me! Weleda Skin Food is a nourishing and hydrating treatment for the whole body, especially hands, feet and elbows. It’s is a deep-penetrating replenishing skin repair cream for skin that is dry, flaky and in need of extra care. Made with organic sunflower seed oil, and extracts of wild pansy, chamomile, calendula and revitalising rosemary extract to perk up tired skin, it’s a great rescue remedy for lack-lustre or generally undernourished complexions. Next Post Lands’ End Launch at House of Fraser Norwich! You can get Carmex in a tube too 🙂 It’s slightly (only slightly) less solid so you can squeeze it out but, in my opinion, it is just as good as the pot version.